Taking a break from the "usual" tasting featuring Cabernets and Chardonnays, host Mark Naismith opted for something "completely different" as the Vino Fino tasters sampled a set of Sauternes from the very fine 1997 vintage. The 1997 growing season started early and held great promise for the Cabernet and Merlot-based red wines. A cool summer and tropical conditions in August caused some problems in the vineyards. The producers in Sauternes and Barsac view 1997 as a very fine vintage, close to 1990 and 1989 in quality. The wines from estates which sorted rigorously are excellent, big, rich and intense. The results show the wines in the "upper division" were rather closely grouped. 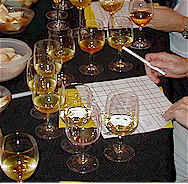 Three wines did not fare particularly well in the statistics, one was in the middle of the pack and the first four wines were separated by a mere 4 points. One taster could have changed the results significantly! Showing a waxy, figgy, mildly-honeyed fragrance at first, as this warmed I was reminded more of apples or an apple brandy fragrance. It's a bit coarse on the palate, fairly sweet with no defects, but not a great deal of excitement given the other wines in this tasting. With lots of honeyed notes to the aroma, this showed great promise (pardon the pun) on the nose. It's nicely proportioned on the palate, but not as sweet or unctuous as some others. I gave it a one star rating (on a three star scale). Climens is a highly-regarded estate, but its wines these days are more refined and elegant when young. As a result, some tasters dropped this in their rankings. I found it very aromatic and a bit floral with hints of Darjeeling tea on the nose. It's honeyed and rich on the palate, but not as "fat" as some others. One-and-a-half stars. The nose shows some botrytis cinerea (the "noble rot" that contributes some honeyed notes to the fruit), but I felt there was some less-than-noble rot to the fragrance and dropped this down to my last place ranking. The flavors are honeyed and significantly finer than the notes shown on the nose. One star. Many Sauternes have a rather high level of volatile acidity as part of their make-up. This one had the most noticeable level of this "sharp" character in its aroma and yet there was enough honey to the fragrance to overcome this flaw at the present time. The wine, with aging, may not fare well. The 97 Doisy-Vdrines has lots of sweet honey and vanillin flavors...very rich on the palate. Two stars. 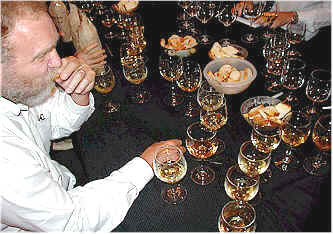 Tax expert Tim Zainer Assesses the Sauternes. I downgraded this because of its "nutty" aromas which I interpreted as oxidation. It is big and rich, though, showing honey and lots of fat, ripe notes. One star. The aromas not only displayed a honeyed character, but there was a "creamy" fragrance to this as well. It is exceptional on the palate, big, rich, honeyed, oily and has a very long, fine finish. Two stars. Nairac stood out from the rest of the wines showing a woodsy, vanillin character, most likely due to its aging in oak. The flavors are big, deep and oily. Vanillin, orange peel and ginger are components of this exceptional wine. Some tasters downgraded it because of its lack of structure and acidity. It was more forward and "ready to drink" compared to most. That may be a flaw if you're looking for something to set aside for drinking in 2030.